Last year we cruised the San Juans in April and loved it, so we weren’t surprised to enjoy it again this year. Empty anchorages, all the park mooring balls open (makes it easier to grab one under sail! ), and great wind for sailing (in fact there was no day where we couldn’t sail). That said we’ve found this April to be much more challenging than last year. We’ve had more rain than last year so far – equaling a lot of pretty chilly days. On grey, wet days we need to run our diesel heater, but on sunny days we don’t (these have been rare though). We’ve also had more wind, from fairly strong cold fronts moving through. We’ve already exceeded the highest wind speeds we experienced in last April and May combined – gusts to 34 knots while sailing, and 25 knots at anchor/mooring. Last year there was only one month out of six (June) where we reached those levels. Admittedly the 34 knots while sailing was our fault – a poor decision to go out on a borderline day. We’ve had a tough time making the go / no-go decision this month, partly because the weather forecasts have been so complex. Making the right call is incredibly tough, as the line between fun conditions and not-fun is very thin. If anything this month has taught us to lean towards conservativism, which seems to be a lesson we need to be retaught every year – it’s easy to forget the power of high winds pushing against opposing current. This entry was posted in cruises on April 17, 2019 by Patrick. A couple days ago we tossed our docklines in Seattle and started our 2019 sailing season. Like last year we’re full-time cruising for spring, summer and fall. We’re excited to say we might finally circumnavigate Vancouver Island this year! We’ve been up part of the west coast twice (as far as Nootka Sound) but have never done the top half. I say “Probably, maybe” because last year our probably-maybe plan was also to round Vancouver Island (but from Haida Gwaii). Cruising plans are never fixed, always flexible. 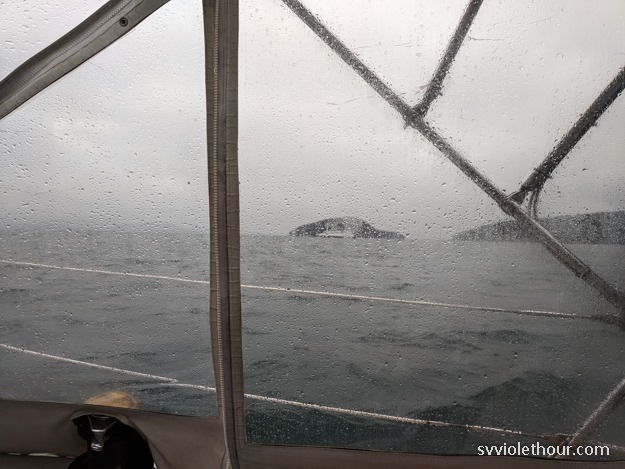 Last year we changed plans because we were worn out from tiring, difficult crossings of Hecate Strait and persistently rainy, powerful southerly gales in the first half of June. We had dreamed of some of the beaches and beautiful scenery of northwest Van Isle (like the Bunsby’s), but rightly decided to prioritize what’s most important in cruising – enjoying the adventure. (As Larry Pardey would say, “as long as it’s fun”). Gross approximation of our possible route (in reality we’ll spend more time in the sounds than this depicts, and may go a bit further north – ex, Shearwater/Bella Bella). This entry was posted in cruises, cruising plans on April 3, 2019 by Patrick.